Explorica is a dedicated leader in educational travel, providing teacher-led tours full of authentic, interactive learning experiences. Since 200, the company has helped more than 1 million students and their teachers experience new cultures, languages and people in over 75 countries. 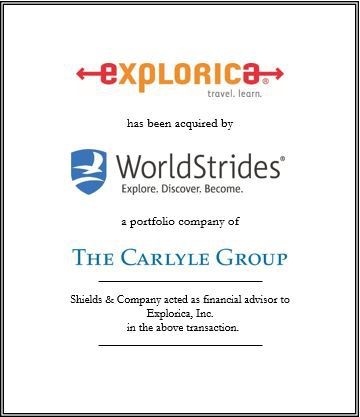 Explorica, Inc. has joined with WorldStrides, the largest educational travel company in the United States. Founded in 1967, WorldStrides provides industry-leading global educational programs to more than 400,000 students from more then 15,000 K12 schools and universities each year. For more information, visit www.explorica.com. Shields & Co. acted as a financial advisor to Explorica, Inc. in the above transaction.